Will Graham, grandson of the late evangelist Billy Graham, has urged Christians to help victims of the California wildfires, saying that believers "should be the first ones to be responding because we represent the King of Kings and the Lord of Lords." "I think as Christians, we should be the first ones to be responding because we represent the King of Kings and the Lord of Lords, and we should be the first ones responding to anybody in need," Graham told CBN News. "Pray with them; help with physical needs as well, and there's going to be a lot of physical needs going forward," he continued. California is experiencing the deadliest wildfires in its history, as at least 59 people have died and some 130 people remain unaccounted for, including many in their 80s and 90s. The number of those missing, authorities say, is only expected to rise. Just 35 percent contained as of Thursday morning, the "Camp Fire" alone has destroyed a staggering 8,650 homes and scorched 138,000 acres in Northern California. Overall, more than 10,000 structures have burned down, officials said. As a result of the fires, air quality alerts have been issued for about a dozen cities, including San Francisco, Napa and Chico, California. Graham told CBN that chaplains with the Billy Graham Rapid Response Team have already been deployed near Sacramento to provide physical and spiritual assistance to those suffering due to the fires. "We send chaplains simply just to sit there and pray with people; cry with people; hold people," he shared. "People have lost everything — they're devastated, and they don't even know where the next step begins. And we just sit there, and we just start praying." "We'll see some people come to know Christ, but I don't think we've ever been there when someone said, 'No, don't pray for me,'" he said. "People in times like this, they say, 'You know, I'll do anything I can; I need help any way I can, so they'll say, 'Pray for me.'" Samaritan's Purse, the humanitarian organization led by Will Graham's father, Franklin, will also be on the ground providing disaster relief. "There's going to be a lot of heartaches, and I know a lot of people have died," he said. "More people died in this fire than any other fire in U.S. history. ... It's a very sad time ... you can't replace humans, so here we just simply pray and pray that God would minister to them in their time of grief." 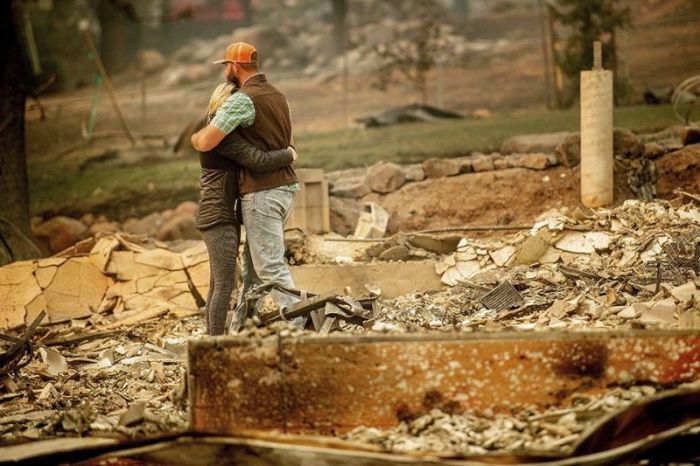 The pastor went on to pray that wildfire victims would "cry out" to God in "this great time of need," adding: "But Lord, I pray that we as a Church, as Christians, and as a society, we come along these people and help these people and minister to them." On Facebook, Franklin Graham urged his 7 million followers to pray for all affected by the inferno: "Would you pray especially today for all those in the paths of these deadly fires and especially for the families whose loved ones were killed? Also we need to pray for protection and strength for the many firefighters who are battling these blazes 24/7." What triggered the fires is yet unknown, but experts say the blaze continues to be fueled by strong winds, low humidity, and dry terrain caused by prolonged drought.